Rex-Cut Abrasives, a 100% employee owned abrasive product manufacturer, released their 2017/2018 catalog offering metalworking industries the latest in premium grinding, blending, and deburring products. 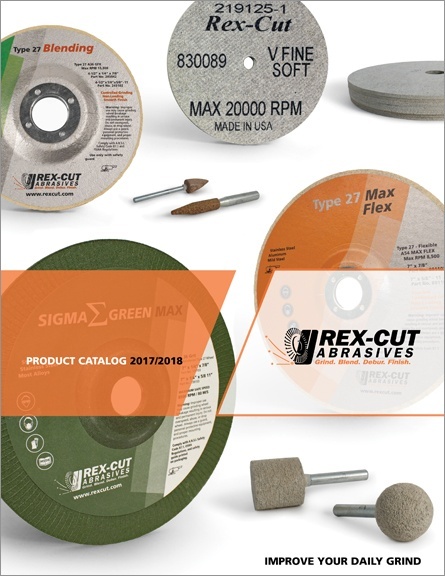 This 32-page catalog includes Rex-Cut’s full line of cotton fiber abrasive products consisting of mounted points, type 1 wheels, depressed center wheels, quick change discs, and finishing sticks. Also featured are the popular Sigma Green and Sigma Green Max aggressive grinding wheels, unitized mounted points, premium flap discs, and specialized cut-off wheels. New items in the 2017/2018 catalog include Type 1 Laser Braze Finishing Wheels, Versa-Cut Cut-Off Wheel, and Quick Change Disc Max. In addition to the printed catalog, we now have an interactive online version which can be viewed here. To download a pdf version of the new catalog, click here. For product pricing and quotes on any of our products, please contact your local Rex-Cut Distributor.